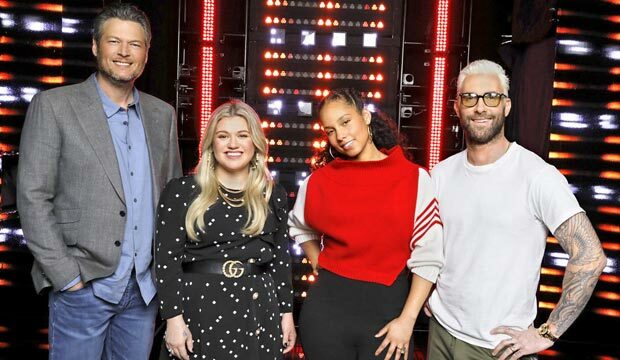 The Voice coaches Blake Shelton, Kelly Clarkson, Alicia Keys and Adam Levine introduce Season 14's Top24 next week. "The Voice" is gearing up for the live shows for Season 14. For the first time in the history of NBC’s "The Voice, "the show’s live telecasts will begin with three consecutive nights of performances, real-time voting and results. The Live Playoffs round of the four-time Emmy Award-winning musical competition series begins Monday, April 16 (8-10 p.m. ET/PT) and continues Tuesday, April 17 (8-9 p.m.) and Wednesday, April 18 (8-9 p.m.). The Top 24 artists – six artists from each team – will perform on April 16 and during the intense Live Playoff round and compete for a coveted spot in the Top 12. At the end of the show, the artists with the most votes from each team will immediately advance to the Top 12. Over the next two nights, the 20 remaining artists will perform live. Members of Team Alicia and Team Blake will perform Tuesday while Team Kelly and Team Adam artists will perform Wednesday. Then, at the end of Wednesday show, the top artist with the most votes from each team will be revealed and advance to the Top 12. For the final four spots, each coach will then make the nail-biting, immediate decision to pick one artist from their remaining four artists to complete their roster. During the live playoff telecasts, viewers can cast up to 10 votes per artist per team via “The Voice” Official App, which is available for download on the Apple App Store, Google Play, and Amazon Appstore HERE or they can vote through Twitter by tweeting dedicated hashtags announced on the show’s official handle @NBCTheVoice. For full voting rules please refer to www.nbc.com/VoiceVoteRules. Viewers in the Eastern and Central time zones will be able to watch and vote during the live show. Viewers in the West and Mountain time zones will also be able to cast their vote on “The Voice” Official App and tweet their choice at the same time as the Eastern and Central time zones if they are following the @NBCTheVoice handle, which will announce which artists are eligible. Starting with the April 23 live telecast, “The Voice” will debut special themed weeks, including “Story of the Song,” (artists will reveal the story of what their song means to them – special memories, significant life moments, & covering artists who have inspired them), “Fan Pick,” (artists will each perform songs selected by Fans who have been submitting ideas via Xfinity’s Suggest-A-Song feature in The Voice Official App) “Challenge Week,” (artists will focus on overcoming an obstacle in any aspect of the performance. The challenge could be song or genre-based, or having to do with performance and stage presence - each tackling something that they see as a challenge on their journey to become a well-rounded artist) and “Special Duets” (In addition to a solo performance, the Top 8 will team up to perform special duets that blend two songs in a unique way).